Hi everyone! I’m Cara from CaraQuilts and I have a really fun, versatile and easy bed-sized quilt for you! 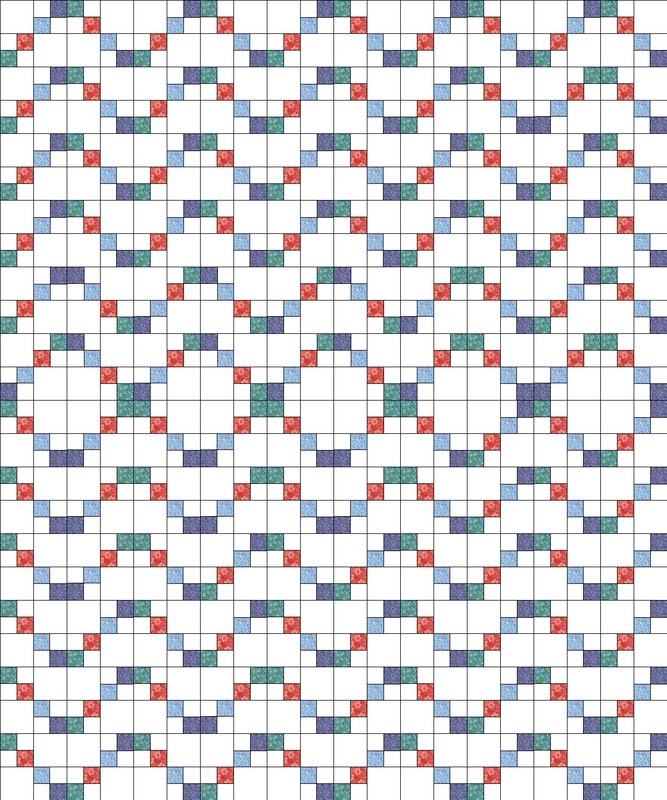 This quilt only uses four patches and solid blocks! It’s all about colour placement and positioning. This quilt would be great for a younger person and any fabrics will work just as well. It can be done super scrappy or with only a few prints. While I used fat quarters, you can make it the exactly the same by using 30 jelly roll strips, cut in half. You can make the quilt bigger or smaller by adding or subtracting blocks in multiples of 2. Any solid can be used and any fabric line will look stunning! Go grab your favorite line and let’s get sewing! As always please read through the directions before starting and if you have any questions or comments please come on over to my blog! 3 3/4 yards Bella Solid Black, or 6 Bella Solids charm packs in black. Cut 2 1/2″ x 21″ strips from the fat quarters. 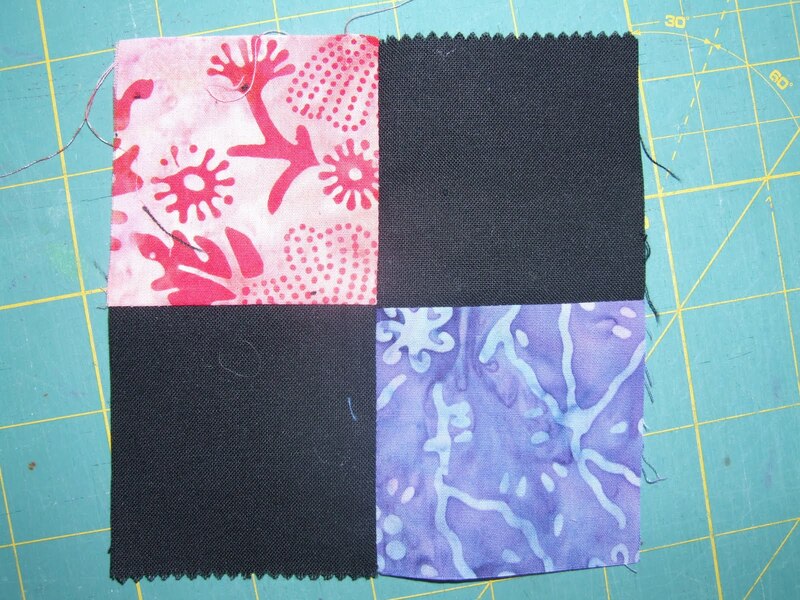 You can use all 9 strips from the fat quarter or cut 2 strips from each FQ in the bundle. You will need (60) 2 1/2″ x 21″ strips. Cut (30) jelly roll strips in half so that you have (60) 2 1/2″ x 21-22″ strips. Cut (30) 4 1/2″ x WOF strips from Bella Solids Black. Sub-cut each strip into 4 1/2″ squares. You need (240) 4 1/2″ squares. 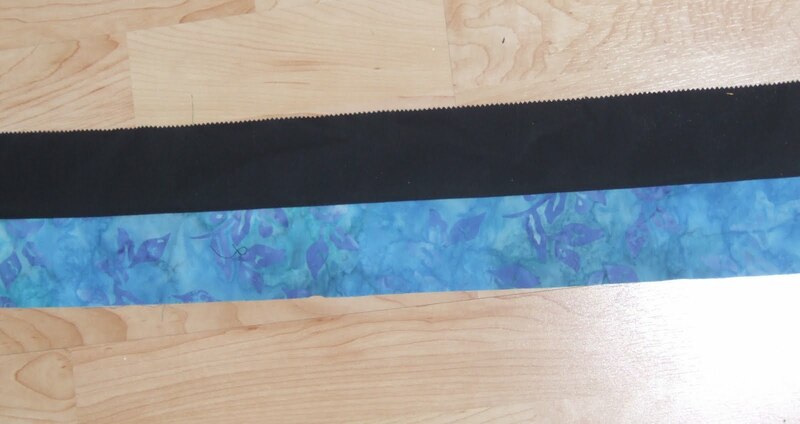 Stitch (1) batik strip to (1) black strip lengthwise. Press to the black. Repeat with all 60 strips. Lay your ruler across both fabrics and cut every 2 1/2″, creating 2 1/2″ x 4 1/2 strips. Cut all of the strip sets like this. You will end up with (480) 2 1/2″ x 4 1/2″ strips. 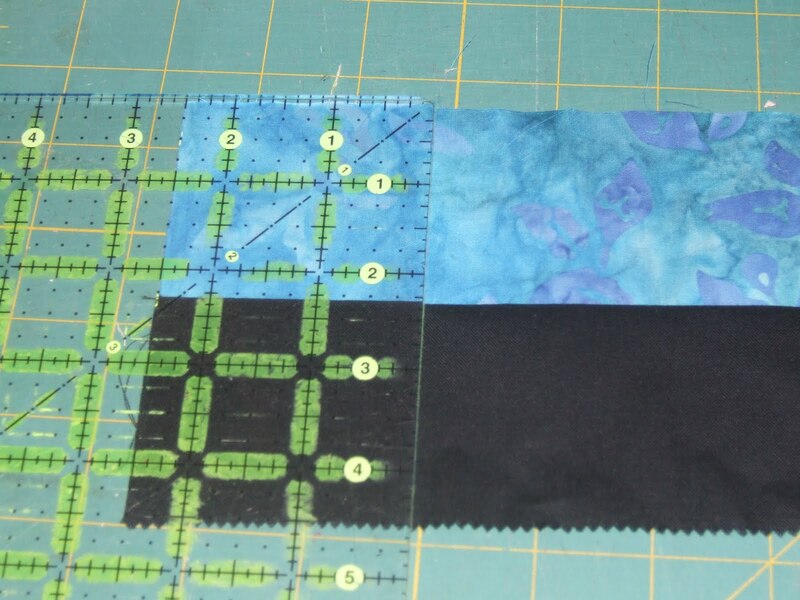 Take (2) of these strips and lay right sides together with opposite fabrics touching (black touching batik). 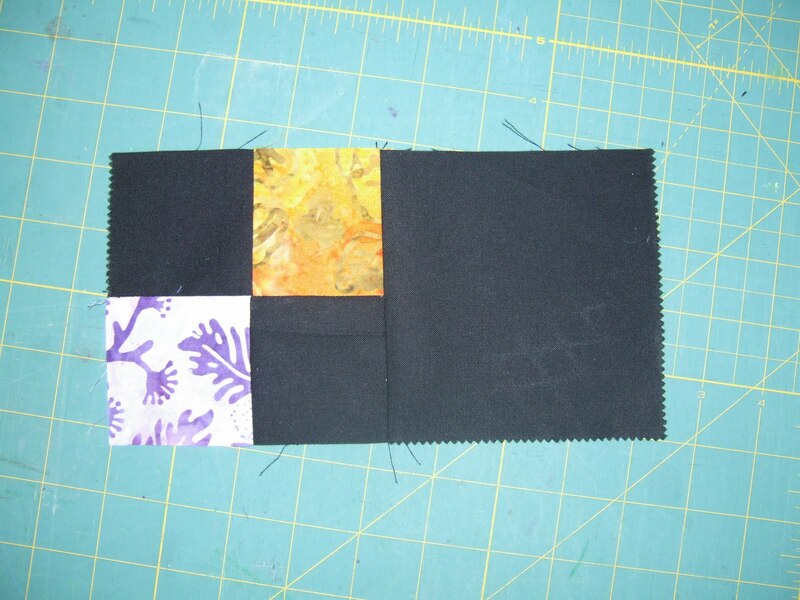 Stitch lengthwise to create a 4 patch. Press open. Repeat with all of the strips so that you have 240 four patches. 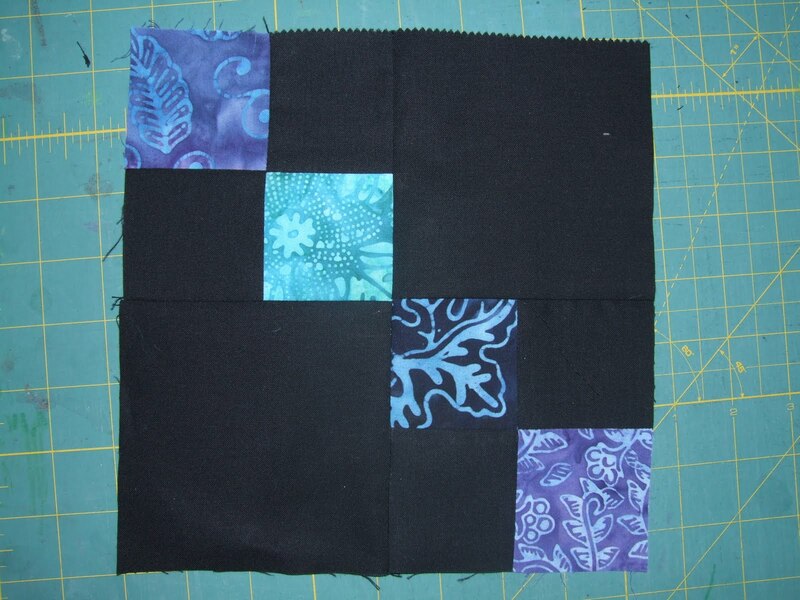 Stitch (1) 4 1/2″ black square to (1) four patch, and press towards the black. Repeat. Take the two units and lay right sides together so that the batik pieces are in the middle and the solid patch and four patch are touching. Stitch together. Create 120 of these. There are 12 rows for the quilt… 6 for the top half, with the first blocks pointing up, and 6 for the bottom half with the first blocks pointing down. Each row has 10 blocks. Stitch rows. Press rows in alternating directions so that when you stitch the rows together the seams will “snap” together. Because the black hides all the seams and block lines, I’ve provided a layout with white so you can see it better. 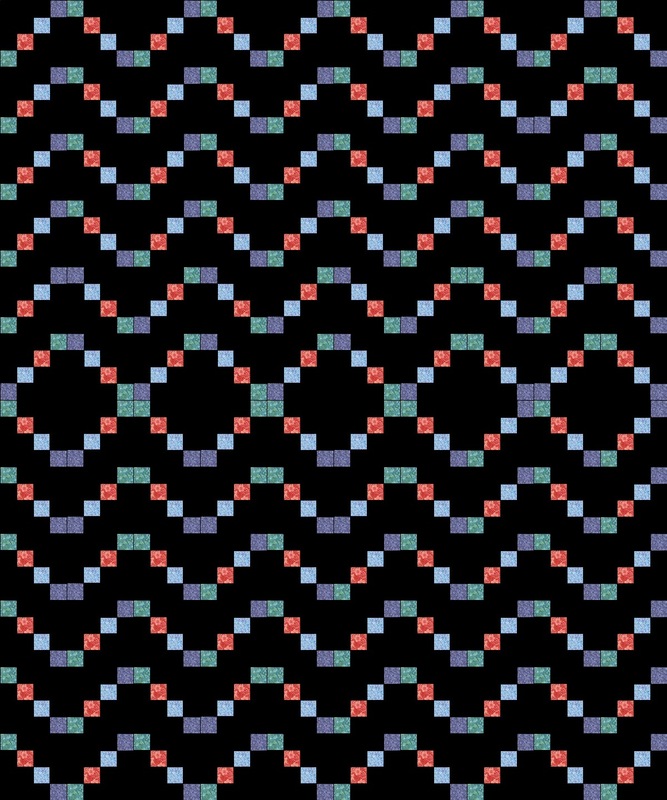 Stitch the rows together. Press well. Now for the most loved/hated words in quilting- baste, quilt and bind! I quilted mine only in the black with circles in each square. 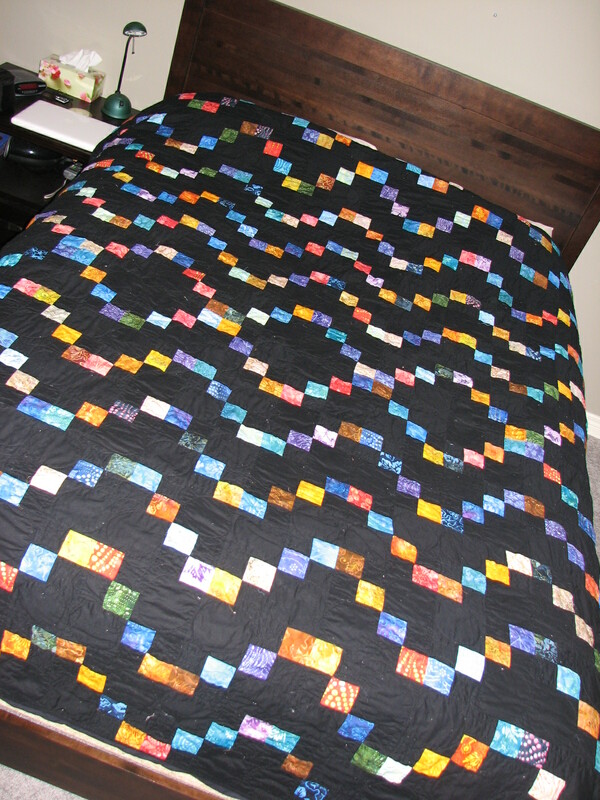 To make this quilt bigger, you can add borders or additional rows. 12 blocks by 12 blocks will yield a 96″ square top. For a King size quilt make 14 x 14 blocks, yielding 112″ x 112″ quilt. One 80″ x 96″ sized quilt! This entry was posted in Fat Quarter Bundle, Jelly Roll, Moderate, Quilt and tagged Bella Solids, Paradise Batiks.